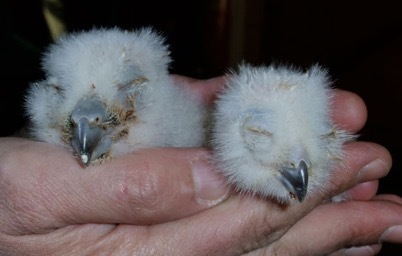 Like the rest of the country, only a few days ago we were being hampered by sleet, snow, hail and all sorts of atrocious weather but today we had some welcome sunshine - and with it, news of our first chicks of the year - a pair of Great Horned Owlets from our mature pair Phoenix and Huron. One proud father - our Great Horned Owl Huron in defensive pose in order to warn intruders against paying too close attention to the new arrivals. We will be hand-rearing one of the chicks and once fully grown, the youngster will become an active member of our flying squad to participate in flying demonstrations during the summer. Also, those lucky enough to have booked onto our "Understanding Owls" courses will have the opportunity to meet our new team member 'up close & personal' at the series of popular events which are held here at the Sanctuary throughout the year (click here if you'd like more information). Meanwhile, we hope they both will grow up to be as handsome as their Dad, above seen strutting his stuff as he ensures that no-one gets too close to the youngsters.